Newport Gwent Dragons number eight Taulupe Faletau should take inspiration from Wales great Scott Quinnell and "boss" games, says the region's ex-captain Colin Charvis. Faletau, 24, will face Edinburgh in the European Challenge Cup semi-final. Charvis wants to see the back-rower more prominent with ball in hand. "When you look at a traditional number eight, look at Scott Quinnell for example, he was running the show," Charvis said. "What we need to see from Toby sometime soon is where he's bossed the game," added Charvis, who was speaking to BBC Radio Wales. Former Scarlets number eight Quinnell, who also played for the British and Irish Lions, won 52 caps for Wales. Faletau was the only Dragons player to play for Wales during the 2015 Six Nations. The 2012 Grand Slam winner says has been offered a national dual contract, which he has yet to sign. 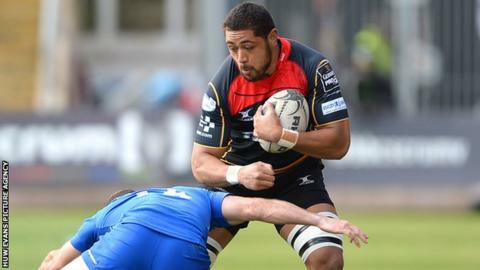 Faletau has a year left on his current Dragons deal, and says he expects to stay at Rodney Parade. Although the Tongan-born back-rower has been an important player for his region and country, Charvis wants to see Faletau have a more explosive influence on games. "I think Faletau is a very, very good player," said the former Wales captain. "Gone are the days of people saying he's a young fellow, this new kid on the scene. "This is a first-choice British Lion. This is a guy with a [Six Nations] Championship, a Grand Slam under his belt. "He's a great player who has just got to come bursting out of his skin. "He doesn't need to shout about it - he can just show it on the pitch."